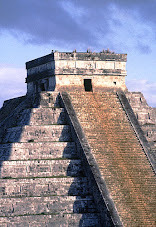 Ports: New Orleans (3), Isla Cozumel, Mexico (2), Harvest Caye, Belize (2), Puerto Costa Maya, Mexico (2), Belize City, Belize. 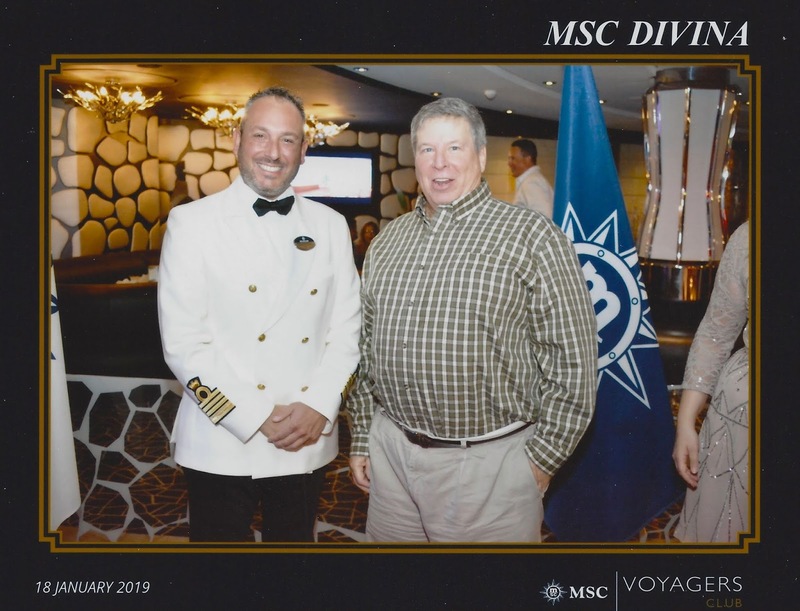 This is my first cruise on the NCL Breakaway, 6th & 7th time sailing Norwegian Cruise Line, 4th time sailing from NOLA, and 140th & 141st cruises overall. The ‘dear wife’ (DW) and I are sailing with the Snoozemates on their 10th annual February group cruise. A good cruise friend stayed at the Ranch Friday night and the three of us were off about 9:15 am headed south using some pretty Texas blue highways. We had a very nice lunch at the Ranch Hand Cafe near Cleveland, Texas…my second time at the unique country cafe. CFS is specialty, but I had the Hawaiian Chicken. The sandwiches looked really good. We continued and joined the Interstate highway system in Beaumont and had an uneventful trip although I didn’t enjoy the interstate as much as the rural Texas blue highways. Soon we crossed the Mississippi River at Baton Rouge and arrived in Gonzales, Louisiana about 6:10 pm. to stay overnight at the LaQuinta. They have opened a new burger place next door named Mooyah with a good selection of hand crafted hamburgers. The fries are great and identical to Guy’s...all was good including the shake. A good travel day. I was up early and used the fast hotel internet before going down to lobby for my complementary breakfast waffle. While the girls were getting ready I serviced the car and we were all ready by our designated departure time of 9:00 am. We were in NOLA about 10:00 am and after some confusion about official parking for the cruise terminal we were parked and in the terminal about 11:30 am. The Julia Street terminal used by NCL is not nearly as guest friendly or as easy as the Erato Street (Carnival cruise line) terminal. I seriously question if I would ever sail from NOLA using this terminal again as the parking is a big mess. It was actually a short walk to the terminal once we were able to get into the official parking area. The check-in actually went well and we were processed and soon boarding the NCL Breakaway. We were on before noon and went immediately to O’Sheehan’s and got a table since cabins are not yet available. Very soon we were joined by various members of our Snoozemates’ group and we basically had a great welcome aboard party for several hours. We did order food and the cocktails very much relieved the anxiety of the parking situation. We even extended the party once we realized that our muster station was on the same deck aft…some of us had a nice 4 hour party overall. Muster (safety) drill went well then we proceeded to our cabin on deck 14 aft. The great relief was seeing our bags out front of our cabin door when we arrived as we questioned if we dropped them at correct location during the parking fiasco. We have a nice cabin on deck 14 with an angled (slightly larger) balcony near the aft elevators. I think a good location. We began unpacking and familiarized ourselves with our cabin home for the next 14 days. About 5:30 we went up one deck to the Lido Buffet and I had a very nice specially cut Prime Rib from the carving station. It was excellent. Our group met on deck six in the atrium area at 6:30 and from there everyone split into groups for dining. 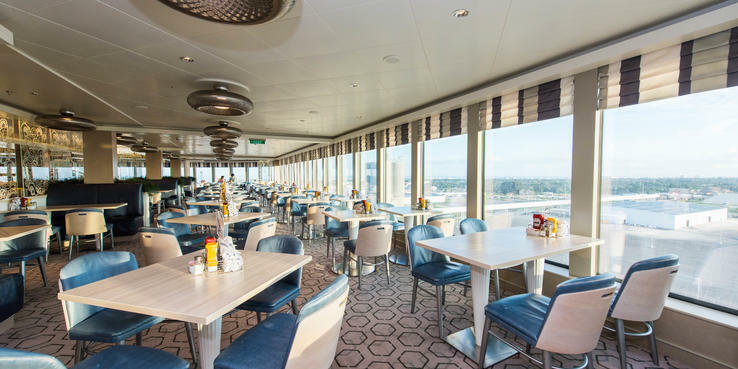 NCL has a unique ‘Freestyle’ dining system with a variety of specialty restaurants and three regular dining rooms with no set-time dining. More on those as we explore the next two weeks. Everyone in the group selected two benefit packages, most going with the UBP Unlimited Beverage Package and the 4-night premium dining. We chose the UBP and paid Gratuities since the DW is a vegetarian; however, I personally will do some premium restaurants. The entertainment tonight is the Welcome Show, but it didn’t fit into our freestyle schedule so did not attend…it did seem to be a bigger show than other lines. We retired to the cabin soon after everyone was off to dinner. As we perused the TV channels I noticed that the Fox News Channel is an option, something not seen on Carnival…a nice variety. It was a interesting day of travel and discovery on board the NCL Breakaway. The highlight was seeing our good cruising friends in the group. Since we retired early I woke at 4:00 am so I purchased the social internet package ($90) and worked on this review for a few hours before sleeping again. I awoke with a 8:44am phone call and thought I had time to make an MDR for breakfast but soon realized that we set our time forward last night and 9:00 am became 10:00 am so I went upstairs to the Garden Cafe buffet for breakfast. 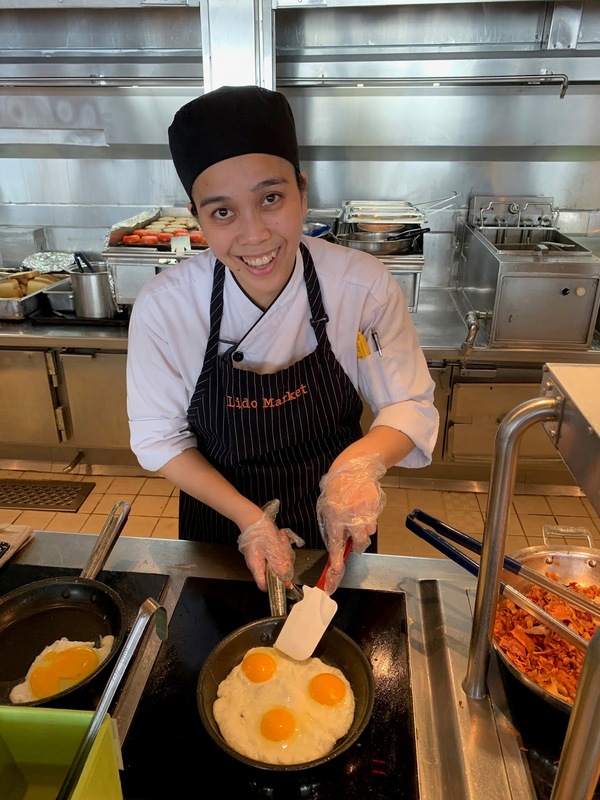 They have several omelet stations, fruit stations, hot & cold cereals, bread & toast stations, and the usual egg choices with bacon, ham, english bacon, and more. I had a pre-made vegetable omelet (excellent), scrambled eggs, potatoes, bacon, and watermelon. It was very good breakfast. I began settling into the cabin opening my packing cubes and hanging some shirts and pants. Certainly a better morning than yesterdays parking/embarkation circus. We did a walkabout and went to see a friends cabin in the solo Studio area, a very nice option for solo guests not wishing to pay a supplement. 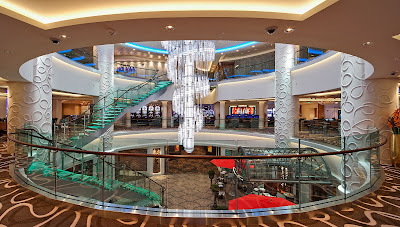 I went to deck six lobby area and had a Bloody Mary and filled my yeti with ginger ale (NCL has Pepsi products). I saw a travel agent friend and her husband at the bar…small world, she did ask if our group had our matching shirts. Correct group but we have outgrown (literally) our shirts, I know I’d have to have a size larger. Went back to cabin to push our make-up cabin light for the cabin steward, but it was already done by 12:30.pm. We went up to the Garden Cafe, so convenient just above our cabin, for a light lunch about 1:30 pm. I had an excellent Pecan crusted chicken, a Pork cordon blu, and a Cherry cobbler with ice creme from the ice creme station. We explored the ship especially on decks 7 and 8 where we had not been previously. We ran into a group of friends on deck 8 that grew to a bigger group of friends that lead to cocktails. Fun people. Returned to the cabin about 5:00 to prepare for evening cocktails and dinner. DW got a light meal from the Garden Cafe and is having a cabin night tonight. I met many of the group about 6:10 pm in the atrium and arranged to eat dinner with friends in Savor Dining Room. Met the assistant Matre’D from Romania and she critiqued the photos of my Romanian dishes in my iPhone. She thought I did an excellent job of getting the right traditional foods. I had the Cobb Salad, New York Strip Steak, and a very nice Roast Beef entree. All very nice. For desert I ordered an Apple Strudel and a Boston Creme Pie. Lots of activities on the ship, but I retire early as we have an early excursion tomorrow. It was a fun spontaneous day on the Norwegian Breakaway. Smooth seas overnight and I slept very well. 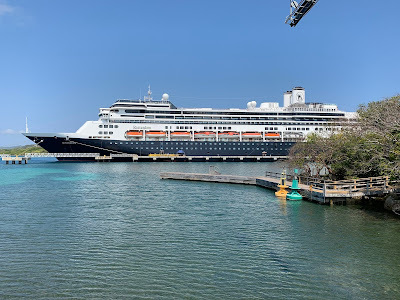 We were docked by 7:30 am next to the Disney Magic at Puerto Langusto in Cozumel close to the town of San Miguel. About 8:00 am I went up one deck to The Garden Cafe and as the early guests were off and no line I had a very nice omelet from the omelet station. Very nice. DW is staying on board this morning so I met our Snoozemates’ CozBoatPeople group about 9:00 am. Eleven of us rented a private boat to take us to El Celio for four hours so we taxied to Marina Fonatur to board the SeaRose. Nice crew. It was windy and El Celio was muddy so we sailed south and had a semi beach day for those brave enough to go into the water. 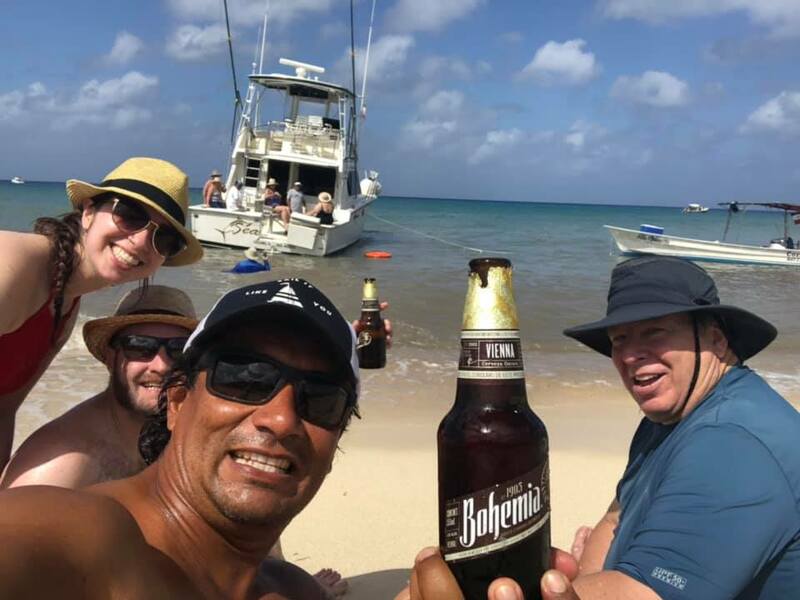 It really turned out to be a ‘booze cruise’ as the crew made up for the wind with lots of beer, tequila, guacamole, sandwiches, fresh fruit, snacks, and more. We even had a Bohemia beer restock. We tried to do some fishing on the way back, but decided to cut it short if they would drop us off at one of the San Miguel piers. That was close enough to walk back to the ship and others to walk to Woody’s in town. Soon we were joined by DW and others for a little party with our friend Nelly. I had one of her huge Margaritas. About 4:00 pm we strolled the shops to Puerto Langusto to board the NCL Breakaway. A stop at Garden Spot to take food to the cabin and balcony to watch the Magic sail away then a view of San Miguel. Since I had enjoyed the hospitality of the boat and Woody’s (i.e.—drinking all day) and we already had food we decided to make it a cabin night. I watched some TV but know I fell asleep early. I did wake in the night and updated to Facebook photos of our day (I only did the Social Media internet package) and watched some reruns of days news and commentary before sleeping again. It was a FUN day with friends in Cozumel. Fine seas overnight and I had a long restful sleep. 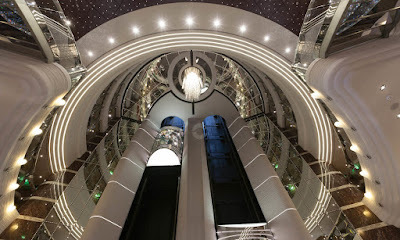 I was famished having skipped dinner and went for breakfast in the Savor MDR. I loved the tablecloths (changed after each guest), excellent service, and great food. I ordered tomato juice, hot milk, melon plate, the days special of Eggs Benedict on a biscuit, sides of bacon, tomato, and country potatoes. It was very good and I prefer the eggs on the biscuit better than the English muffin. I may do some at the ranch. I really feel energized (for an old guy) after the long sleep and breakfast. 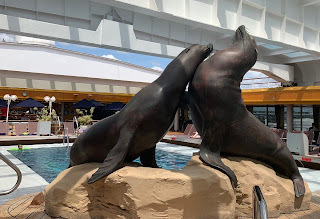 I had balcony time the rest of the morning updated the blog and reviewing the rest of the cruise. I tried to make show reservations and many already filled so looking at options to book early next week. I had a nice Asian grill lunch in the Garden Cafe and filled my Yeti with ginger ale for an after lunch walkabout. 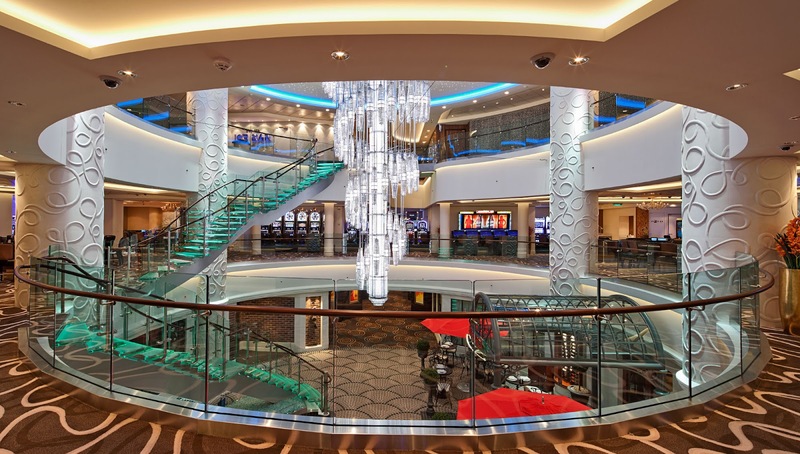 The deck 8 outdoor promenade style walk is great place for outdoor air, bars, and some seating without the mass of humanity on the Lido deck. I did have a beer with friends as they came by. I was able to get in a short nap before prepping for dinner. We met the group on deck six after 6:00 pm for apéritifs and nice music then to the Manhattan MDR on deck 7 aft where we had a table for nine. This is the primary MDR (main dining room) and is very nice with entertainment or music while dining. There was mixed reviews from the group on the dinner, but I really enjoyed mine. I ordered the Pasta Fagioli Soup, a Tomato salad, and two entrees: Tenderloin Beef Skewers with Asian Vegetables & an excellent Hawaiian Style Pork Belly. For dessert a Carrot Cake (too dry) but a nice warm Bread Pudding. It was 10:30 pm when we finished so we retired to the cabin. It was a nice relaxing day on the NCL Breakaway. Seas calmed and I had a very nice sleep. I woke early and worked on review and some FB time as we were docking at Harvest Caye. About 8:15 am I went down to the nocchi MDR for breakfast. I ordered three sunny-side Eggs, Bacon, Ham, hash brown Potatoes, hot Milk, Tomato Juice, Toast, and an assorted Melon plate. The food was very good but the service was better in Savor. Odd since they are basically the same restaurant, but it may have been just the server. Relaxed this morning then I went down to deck four to exit the ship and look around the island. They have a nice covered walkway onto the island and a small golf cart type shuttle for seniors. 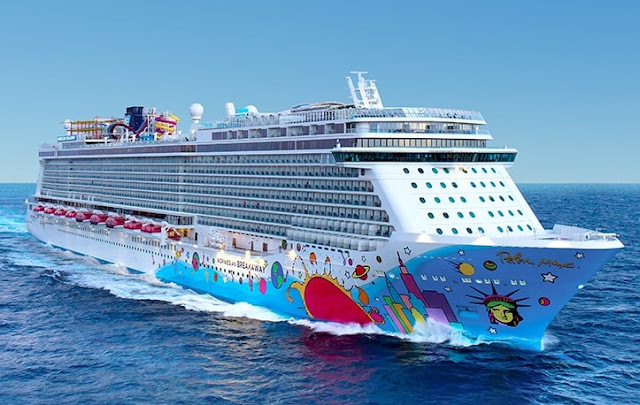 The island is a Norwegian Cruise Line owned destination site with the convenience of a dock. There is a very large pool and very large beach that are the primary destination of guests. Also shoppes, a wildlife area, Zip line from the Lighthouse, a lagoon, and more. 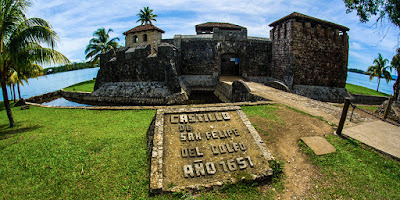 It is easier than stopping at Belize City especially if your just looking for sun and a beach. It was warm and humid and since I didn’t wear a bathing suit I returned fairly early to the ship. I met the DW as she was going ashore with friends and warned her about the heat. 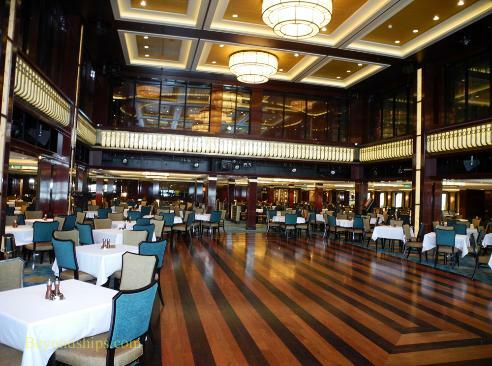 I went up to the Garden Cafe for lunch and as on other cruise line many of the crew is allowed to eat at the buffet. Rather busy since only one side of buffet was open. I had a Caribbean meat-loaf and vegetables. I had cabin and balcony time in the afternoon. Only time for one cocktail before the 6:30 pm curtain time for the show ‘Rock of Ages’. BTW-If attending the shows be sure to make reservations early. We had great seats on row three for the Broadway style show and it was a very entertaining show. I never saw the theatrical play before tonight but I did see the movie so was somewhat familiar with story line of the one hour forty-five minute production. Very professionally done and a must see show. We had dinner in Savor about 8:30 pm. It was a nice meal with just the two of us. DW ordered the Bruschetta and Potato Gnocchi entree. I ordered the Mozzarella and Plum Tomatoes, Lime and Dill Shrimp, and the Pan-seared New Zealand Haki Fillet as an entree. For dessert we had: Black Forest Cake, Flourless Chocolate Cake, and a Banana Split. After a long evening we retired to the cabin. It was a fun day on the Breakaway. Very smooth Caribbean seas overnight and I slept very well. I was awake before we docked at 7:00 am in Costa Maya. Weather is nice and the water looks best of the cruise so far. I had a relaxing morning reading the numerous birthday posts on Facebook. I am a very lucky guy. 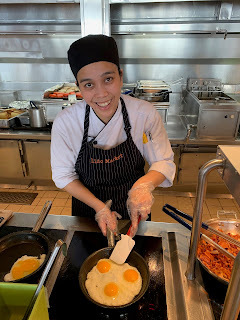 I went up to the Garden Cafe for breakfast about 9:00 am and no line at omelet station as many are already off the ship at this short port call. After my casual breakfast I went up to deck 16 aft about 11:00 am where we had our annual Bloody Mary morning with most the group in the Spice H2O area. They have a bar and very nice cool off waterfall, the only negative is that it is a smoking area. Most actually stayed until our early sail away about 1:30 pm. A Fun spontaneous party. A stop at the Garden Cafe for light lunch of pork cutlets and potatoes then retired to the cabin for a much needed afternoon nap. We did something a bit different tonight, we met at Shakers the cocktail lounge for our aperitifs, and Cosmopolitans for me. 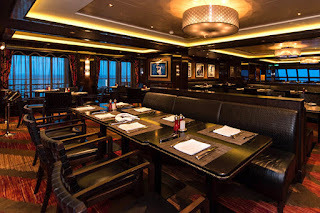 A group of us had a late dinner at Cagney’s, the steakhouse, on the NCL Breakaway. I ordered: the Slow-Roasted Pork Belly, the Iceberg Wedge, and the Porterhouse Steak. It was very nice. To be honest the pork belly in the MDR was better and not that big an upgrade from the MDR. IMHO. I retired to the cabin about 11:00pm. I was a nice relaxing birthday on the NCL Breakaway. Smooth seas and I slept very well. For a change we went up to Margaritaville for breakfast. Basically the same as the Garden Cafe with fewer selections but not as busy. We then began a walk of the ship just to stretch the legs a bit. It’s a large ship and also busy with 4300 guests on this week. We then had cabin time and watched two good movies. It was time for a late lunch 1:40 pm in the Garden Cafe and we had a very nice table and watched the Carnival Dream as she sailed along side of us on the starboard side. I enjoy that. I enjoyed a couple of beers in the Atrium with the boys, I went with Peroni beer for my Italian friends. We had cocktails and apéritifs in Shakers again tonight with more of the group. Tonight was the best meal of the cruise…most all the group ate at the Teppanyaki restaurant. They have tables of eight guests for each chef and it is quite the experience. I ordered an Asian cocktail with the Lychee fruit to start. We were served the traditional beans spouts to start as well as well as two dipping sauces. First courses were a Soup and Salad. As an entree I ordered a Beef fillet and Sea Scallop combination. They also served everyone an extra shrimp course as well. Very filling. Of course the show while cooking the fried rice is something to see…it starts with the tools, in which the knife, fork, and spatula are tossed, flipped, drummed, and clanged together. Next, the chef skillfully chops and dices the food, and then quickly sets the grill aflame, creating a feast that’s both culinary and visually entertaining for the guest. I retired after dinner and unlike most other guests I don’t have to pack tonight. 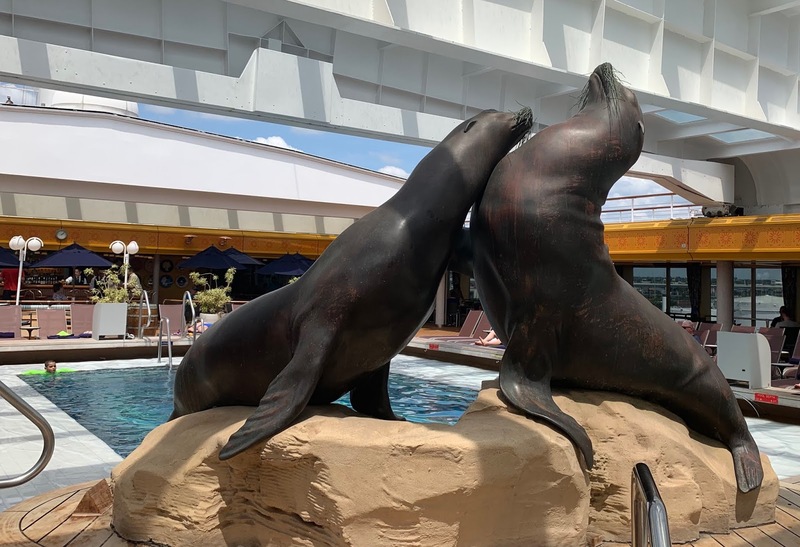 It was another relaxing sea day on the NCL Breakaway. I woke very early, about 4:00 am, and noticed that we were in the river with internet available on my iPhone so started my mail for the week I missed. Also posting to the blog. I will get a different internet package this week. We began approaching NOLA about 5:15 am interesting to see the big city lights as we sail by on the river. I had a very nice leisurely breakfast in Savor: very nice mixed fruits, 3 eggs sunny, bacon, ham, hash browns, toast, tomato juice, and hot milk. DW went up to the buffet and returned with her balcony breakfast. We heard debark announcements and it seemed to going very well in fact they were making last calls about 9:15 am. I had just told DW that they may ask for the B2B people early and then they announced and called on phone. The B2B people met on deck 8 and most where our group. We were taken down to U.S. Customs, then back through port Security, then boarded the ship again. About a 45 minute process. We were back in cabin by 10:30 am. 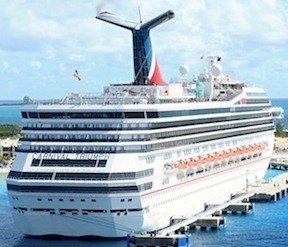 Everything going so smooth that cabins were open to guests an hour earlier than previous week. I made reservations for the shows we didn’t see last week and we had some cabin time with movies until time for Muster Drill. I want to mention that we sat in the Taste MDR during drill and the table settings were covered by table coverings, on Carnival for example, they do not do that and I always felt that those guests eating dinner (especially on first setting) will be exposed to the germs of guests from safety drill. Good work NCL. Most of the group ate in O’Sheehan’s as last Sunday, but I’m having a work day and got a quick lunch at the buffet. About 6:00 pm DW and I went up to Shakers for a cocktail then back down to deck six atrium to meet friends. The atrium is really the only area with enough seating for our group. We went to eat at the Garden Cafe just as we did last Sunday as it is Prime Rib night up there. This week I discovered that they do have a hot grill associated with the carving station it was just out of site. My thick cut perfectly seared Prime Rib was excellent, second best meal of the cruise (so far). We retired to the cabin after dinner since I have been at it since 4:00 am. today. We did turn our clocks forward to EST so time evened out. I basically used all my data on my phone, but it was successful, uploaded Blog for last week and even booked a cruise for a client. Also downloaded the NCL app so that will make monitoring my ship board account easier. I also purchased 250 minutes of internet for this week ($125.00), enough to check mail and update blog. It was a smooth and interesting transition day on the NCL Breakaway. Smooth seas overnight and I slept well. We sat in river for a time that actually woke me as I had been so used to being rocked to sleep at night. Clear blue skies and water, but a bit breezy. I went up to the buffet for a light light breakfast as I have plans for lunch today. Today I was insulted to my face by staff. I went to the Cruise Next desk to purchase a single future certificate, the desk is well known for their up sell philosophy so I said upfront that I am an experienced cruiser with 141 cruises and a travel agent and that I am fully aware of the program. After stating all that she said if I only got one that it was stupid, i.e. I am stupid. Stupid was her word. I know that the next level up, two futures offers a better return of OBC (on board credit) than what I wanted the single. 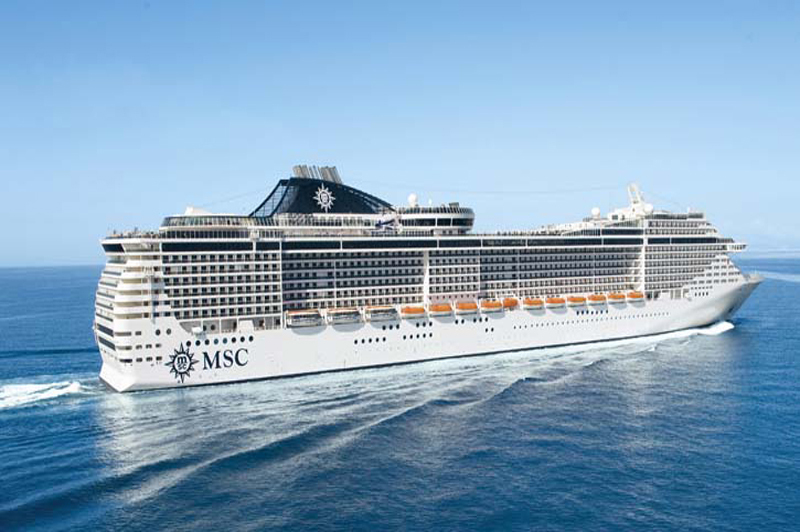 But I only want one now as I can get more on the next cruise when I will not be in a group and will need more OBC. Still deciding what to do about this but to insult a guest is surely not in their training. Went to Moderno Churrascaria for the Seaday BBQ, this was excellent. Beautiful room with excellent salad and dessert buffet and various BBQ dishes served in chafing dishes. I had some nice salads and a selection of Ribs, Steak, Chicken, and Sausage. They have service and not too busy as it had not been discovered as yet by guests, but only two sea days this week to enjoy it. We had a relaxing afternoon enjoying balcony (with cloudy skies) and cabin time. We met the group for cocktails in the atrium then went to the theater for excellent production show Burn the Floor. A very high energy show featuring the dancers and two feature singers. Great exhibition of dancing. After the show we went to Savor for dinner. It was a nice and relaxing dinner, I ordered: the Scotch Beef Barley Soup, Cobb Salad, Parmesan Crusted Pork Chop grilled entree, and Cherries Jubilee for dessert. It was a good dinner with good service. We retired after dinner. It was another great sea day on the NCL Breakaway. Smooth seas overnight and I slept very well. Sunny and calm seas this morning, but wind increased in Cozumel in afternoon…perhaps we should have done our boat hire this week. I had a great breakfast in Savor MDR as most guests were preparing to leave the ship. Three eggs with the works and biscuits. 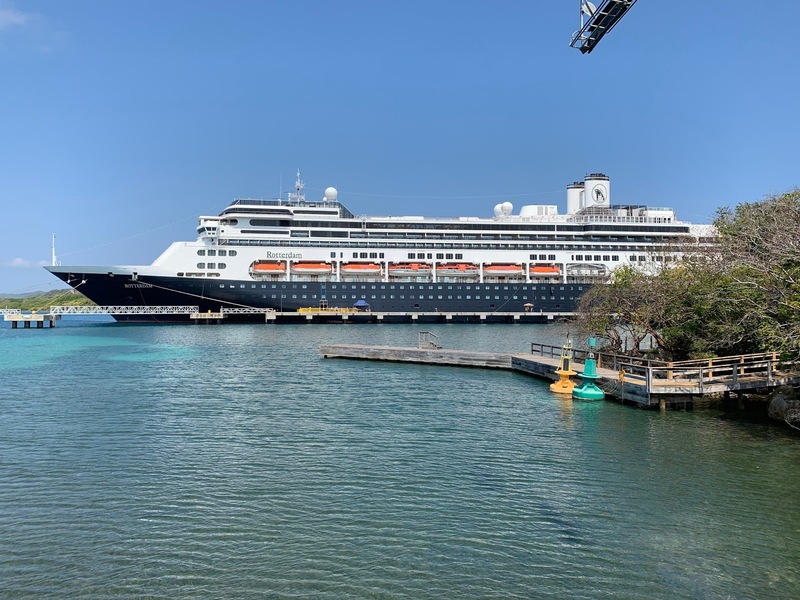 Since we are docked at Punta Langosta I left the ship and walked to downtown San Miguel. I was at Antonio’s Barber Shoppe by 10:00 am. and Martin cut my hair as he has done for about 12 years now. Then to Woody’s table 7 to use the internet. The 250 hours on the ship is a bit short of my needs. The Coca-Cola sure tastes good here and they have a new female musician too. Soon friends began arriving and we had 13 people for lunch. Woody’s was busier than I have ever seen them...very busy. The girls shopped, I went to the drug store, we enjoyed the guacamole and chips, and listened to music. It was great FUN as always at Woody’s Bar and Grill. I took my time walking back to the ship and stopped for a Bohemia beer at the Thirsty Cougar, much better to be docked at Punta Langosta to have this walking option. As I was boarding the ship I saw the Assistant Hotel Director whom I have had a very friendly relationship all cruise. He welcomed me back and was quite aware of my situation yesterday. Soon the Hotel Director arrived and headed straight for us. She was on the problem. I stopped by Shakers to fill my yeti with ginger ale and soon after arriving in the cabin had an apology phone call from the Cruise Next manager. Apology accepted and all now good. In fact I’m sending her clients to get a B2B booked and I’ll still need my single future as well. Thanks NCL. I met the group for cocktails at 6:00 pm in the atrium and six of us ended up at Manhattans MDR for dinner. I ordered the Potato Soup, Beet Salad, Roasted Beef entree and Bananas Foster for dessert. Service was a bit slow, but it was prime dining time, I think I like Savor MDR much better. After dinner it was cabin time. We finally had a one of the ladies win in the casino, but personally I haven’t really done the casino on any cruise in a while. 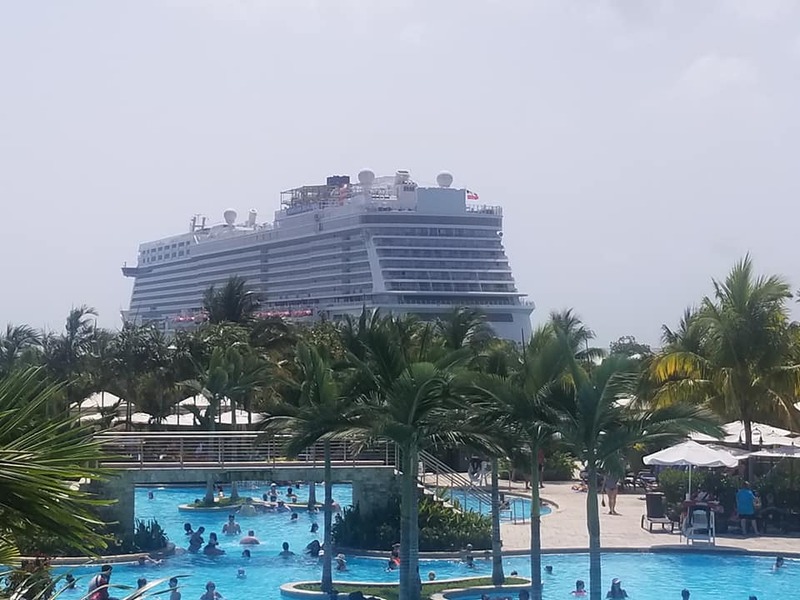 It was a very nice Cozumel day on the NCL Breakaway. Smooth seas continue and I slept very well and late…until 8:30 am in fact when they began announcements for tendering into Belize. I went to Savor for breakfast as it’s Biscuit Benedict day, I ordered them and a Huevos Ranchero plate as well. A very nice casual and filling breakfast. We are staying on the ship today as we have been to this area many times. 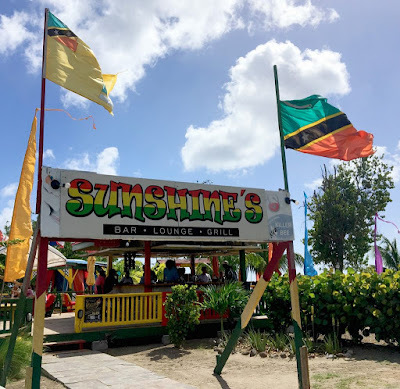 We’ve done it all: our favorite Caye Caulker (many times), River rafting, Belize Zoo, two Mayan ruins, Snorkeling, old Belize City, and more. I went up to deck 16 for some waterfall and hot tub time then met the guys for a Bloody Mary. Just a light lunch in the Garden Cafe then balcony and TV time in the cabin in the afternoon. DW and I had date night, going to Shakers for some apéritifs, the bartender creating a cocktail for me consisting of Titos Vodka and Elderflower. We then went to Moderno Churrascaia where we were seated at a two top window facing the impending sundown on the Caribbean. This is a Brazilian style churrascaia where the meat is served on skewers brought to your table. We had not eaten in one since we were last in Rio de Janeiro, Brazil many years ago. I started with the Brazilian cocktail Caipirinha. You begin with the best salad bar I have seen on a cruise ship. The display was fantastic and items included: Lettuce, Arugula, Spinach, Pickled Hearts of Palm (very Brazilian), Sliced Heirloom Tomatoes, Beet-root, Couscous, Potato Salad, Tabouli, Pickled Onion, Asparagus, Artichokes, Sweet Peppers, Cherry Tomatoes, and much more. Also a variety of sushi and cold meats including Prosciutto. With Two Soups and Various Breads including small Cheese Breads on your table. Cheeses included: Mozzarella, Toasted Provolone, Oregano Cheese, Chanco and more. They served a wide variety of meats to your table on skewers, my favorites were: Fillet Mignon, Lamb, Strip Steak, and Bacon-wrapped Chicken. For dessert we had the Mango Rice Pudding and Chocolate/Coconut Tres Leche Cake. It was a fantastic meal, thank you Vesna and NCL. Allow two hours for this wonderful experience. After this wonderful dinner we retired for cabin time. A wonderful day on the NCL Breakaway. A bit of rolling seas overnight and we were docked by sunrise this morning. I had some internet time and watched news on TV early this morning. I had a light breakfast in the Garden Cafe then walked about the ship this morning. Balcony and cabin time until lunch at O’Sheehan’s, I had Buffalo Wings, Rueben Sandwich and a Perone beer. It was very busy at O’Sheehan’s and it’s a good option as food is available almost 24/7. Beautiful weather so guests really enjoyed the private island of Harvest Caye, but it’s a ship day for most in our group. We had reservations for Rock of Ages (again), but there’s illness in the cast (washy-washy) so it was cancelled. We met all the group for cocktails and I was also able to book a couple on a nice B2B fall foliage cruise in 2020 through the Future Cruise desk. We went to the substitute show Three Tenors of Rock in the theater that sing rock music and basically a glorified Karaoke Show. It was a full house. We are fortunate that we saw the feature Rock of Ages last week as it was never done this week. Most of our group are using their dinner vouchers this evening in the premium restaurants, DW and I ate in Taste MDR this evening. I ordered: the Broccoli Soup, Southwestern Salad, and Chinese-style BBQ Pork. For dessert a Banana Spilt. About 4000 guests this week 300 fewer than last week and more locals, I love hearing the Cajun accent around the ship. Another nice day on board the NCL Breakaway. Smooth seas overnight and I again slept well. We arrived early in Puerto Costa Maya and ready to disembark at 7:00 am for those that wished. I went down to Savor for a very nice breakfast: 3 eggs, ham, bacon, hash browns, fruit, hot milk, and more. The HAL Rotterdam is also docked with us and I sail that ship next month. Thankfully after we were on the dock the MSC Armonia attempted to dock and was battling high winds. If we had not already been ashore we would not have been able to debark for a half hour+ due to safety. DW and I walked into the port area about 9:30 and we enjoyed a few Coca-colas and she shopped a bit. Pricing is much too high, they must have a high fee to the port authority. It actually makes us want to take a trip to Progreso Mexico for some bargains as we could use a few things. We returned to the ship about 11:30 am as the MSC Armonia guests were pouring off…a noticeable more international group. Once on board we paused at the Atrium Bar for some refreshing cocktails to cool ourselves. Yusef, our very congenial Turkish bartender, also fixed me a special cocktail and the Hotel Director Vesna stopped to say hello…she is so great. I went up to deck 16 and did the waterfall to cool off…very nice concept. The bar there also specializes in a frozen Mango drink as I discovered last week so I had two of those with floaters. Nice. About 2:00 pm-ish a light snack of fresh Chicken Breast from the carving station in the Garden Cafe. We sailed about 2:15 pm and are now heading back towards NOLA. Balcony time and an actual nap in late afternoon…it was nice. We went to our group meeting area for cocktails with most of the group about 6:00ish then DW and I attended the encore production show Burn the Floor at 7:00. We scored great seats again on row three center for this high energy show…I’ve never seen so much high energy dancing in a one hour time frame. Amazing. They had a great farewell with crew and we got to see our favorite members of the staff. Very Nice. After the show we went to the Garden Cafe where they are having Asian Night. I had Peking Duck and some of my favorite Asian dishes…The Duck & Vegetable rolls were very good. We had cabin time and communicated with the DD in Florida after dinner. We turn back our clock to CST tonight so a good night to rest from a busy day. It was another good day in Mexico and the NCL Breakaway. Smooth seas overnight and I slept very well. I went down to Savor for my final proper breakfast and it was also Biscuits Benedict day. Great breakfast experience: good food, service, table setting all week. Beautiful day so I had balcony time then ran into friends on deck 8 and had beers. About 1:15 I went to Moderno for lunch. It was Spanish food day but it was more Mediterranean IMHO with Spanokopita, two pork entrees, chicken, and fish in the buffet chaffing dishes and they had a great salad bar. I had a very nice green salad with pickled artichokes, onions, and peppers. I also had the Spanokopita, and Pork cutlet entree with Rice pudding for dessert. More Balcony time after lunch as the Carnival Dream is approached us on starboard (my balcony) side. Loved watching it sail along with us and enjoying perfect weather. We did some packing this afternoon, I’ll finish early in the morning. We met the group for cocktails in the Atrium. It’s really the only place that 10-12 can meet and get cocktails on the Breakaway. MSC for example has three large banquettes for groups in their atriums. We did make our own area by moving chairs each evening. It was a FUN final gathering. DW and I had our final dinner in Savor, I ordered the Scallops and Prime Rib, and it was good. Adriana from Romania stopped by and DW happened to be wearing her traditional Romanian blouse this evening that caught her eye. We retired early as the plan is to wake early. It was a nice final sea day on the NCL Breakaway. We were awake from 3:00 am when we were notified that the DD was in labor and admitted to the hospital. Several weeks early. Well no sleep from then on. We will soon be in NOLA exactly half way between the Ranch (home) and DD in Tampa Florida. It’s about nine hours drive either way. What to do? We have another passenger riding with us to complicate matters. Who will use air and where do they go. Poor connections to TPA so driving would be faster, but ultimately we decided to go home as probably would not be in Tampa in time for delivery and there is also a lot of items we are supposed to be transporting to Florida. Long story short we made it home before delivery so probably would have made it to hospital in time. We will head that way after a bit of a rest. Drive was rainy at times, but uneventful and we enjoyed a great TexMex dinner at Los Pericos in Huntsville, Texas. 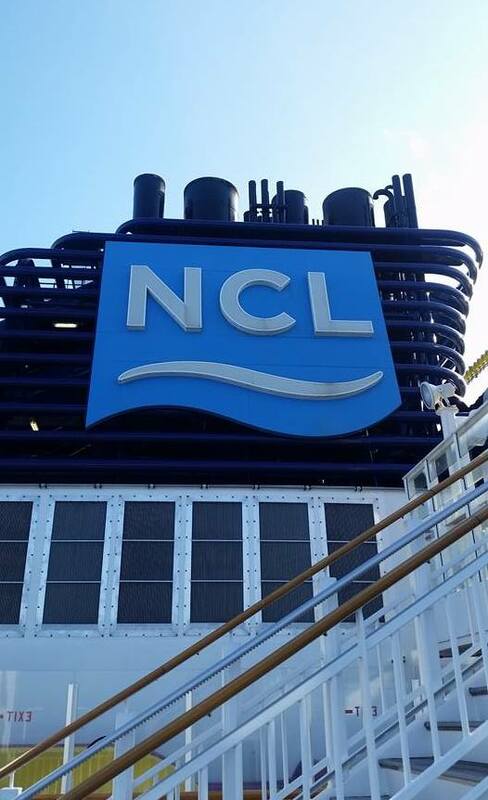 The NCL Breakaway entered service on 30 April 2013. She was constructed at Meyer Werft Shipyard in Papenburg, Germany. We had cabin 14842 a balcony cabin (with extended angle balcony space) located on deck 14 near aft elevators. The cabin has a double bed, a push button safe with light, two-section closet, small couch, two electrical outlets on counter/dresser, interactive TV, Telephone, excellent Hair dryer at counter/dresser, refrigerator (never used), and nice fixed doors at shower. My cabin steward, Aquilino Bathan from Philippines was very good, the cabin was always clean. This is the first cabin ever that was actually too cold if we had the thermoset on coolest setting. We never needed the fan we brought along. Huge difference with the Freestyle dining on NCL. There are NO set dining times anywhere, but the option to dine in six or seven dining venues or six premium venues with an extra cover charge. I really like the Tablecloths in the primary dining rooms…very classy compared to Carnival Cruise Line. They also have one MDR with stricter dress code and one MDR with more casual dress code. Something for everyone. I like it. The food was very impressive, but also different to me so change is good. They did have a REAL steak, among other nice entrees offered every night on a set menu if you wished, or the daily menu that changes with special entrees. Very impressive menus and waiters were very friendly and helpful. The BBQ on sea days is great. The bakery is very good as all breads were excellent. There are two almost 24 hour soft serve ice creme machines in addition to an ice creme station in the Garden Cafe. 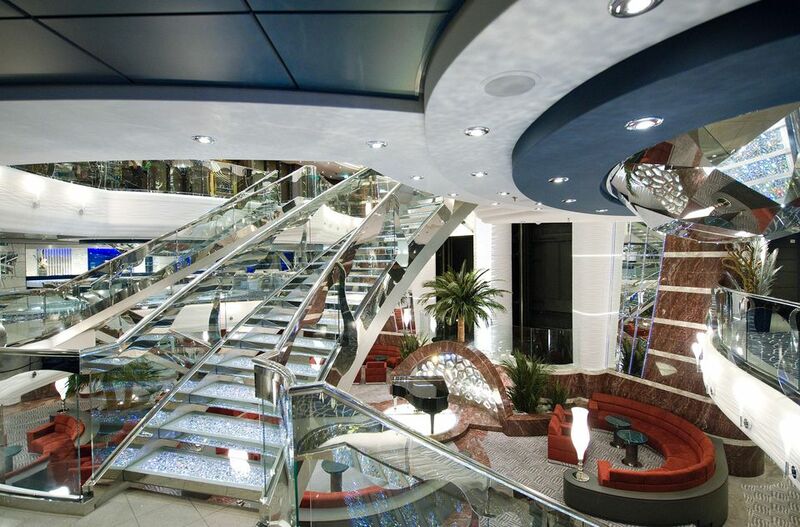 There are 21 bars on board, my favorites were Shakers the martini bar and Headliners bar in Atrium. One of the few items that need improvement IMHO is slow bar service, but it is due to that the vast majority of guests (75%) have a drink package. Most crew were friendly, helpful, and efficient. The NCL iPhone App is wonderful, especially for checking your account balances or reserving entertainment.